With the latest bald eagle admitted 19 December 2016 with HI blood lead levels as measured on our in-house diagnostic equipment, several have asked questions about why, how, and from where do eagles get lead poisoning. How can eagles and other birds get lead in their system? Primary lead exposure in animals is caused by the animal eating lead directly, mistaking it for food or grit. This happens with seed-eating birds like mourning doves. Secondary lead exposure in animals comes from the animal eating another animal that contains lead. This prey animal either swallowed lead (like a lead sinker) or has lead shot or pieces of a lead slug embedded in its body. How are eagles being exposed to lead? 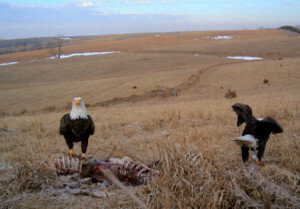 Beginning in 2004, Iowa wildlife rehabilitators admitting bald eagles began testing for lead levels in blood (alive) or from liver tissue samples (if dead) and taking x-rays to look for ingested lead. An abnormal lead level is above 0.2 ppm as a blood lead level or above 2.0 ppm as a liver lead level. In the 11 years (2004-2014) of data, only 49 of the 322 eagles admitted DID NOT have a lead level checked or 273 eagles had a blood lead or liver lead level test completed. 136 of the 273 eagles tested (or 50%) had an elevated lead level. 136 of the 322 (total sample size) eagles admitted (or 42%) had an elevated lead level. In partnership with Whiterock Conservancy, SOAR conducted a field survey during the 2008 winter shotgun deer season to document the incidence, abundance, and distribution of available lead fragments in white-tailed deer carcasses harvested with lead slugs. Fourteen lead-slug-shot white-tailed deer carcasses and associated gutpiles were borrowed from cooperating hunters for x-ray. Whiterock Conservancy is now a non-toxic ammunition only hunting area. This x-ray is of a deer carcass that was shot with lead deer slugs, and reveals that the main body of the slug traveled completely through the deer, but lead shrapnel fragments were left in the carcass at the points where the slugs passed through and shattered bone. (Lead glows bright white on an x-ray.) This shrapnel looks quite similar to the irregular shrapnel pieces found in eagle digestive systems. In this x-ray of a deer’s mid-section, you can see the lead fragments where the slug went through the ribs below the spine and grazed the top of the spine. SOAR also partnered with the Upper Mississippi River National Fish and Wildlife Refuge and x-rayed gut piles from deer harvested as part of a public managed hunt during the winter of 2012-2013. See image at left. 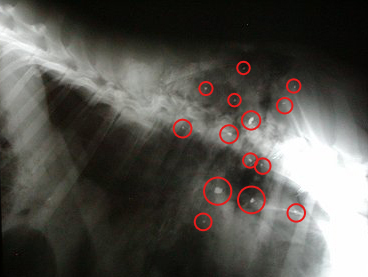 Twenty-one gut piles were digitally x-rayed at the veterinary clinics that SOAR uses. 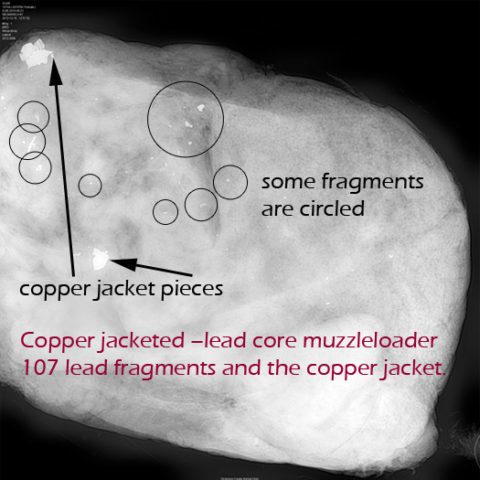 Warner et al stated in the results section of their paper, “Their [SOAR’s veterinarians] digital equipment produced high-quality images that allowed a more accurate identification of small lead fragments. Eight of the 21 digitally radiographed offal piles (38%) contained from 1 to 107 high-density fragments of different sizes and shapes.” Read Bald Eagle Lead Exposure in the Upper Midwest research paper here. How does lead impact an eagle? Signs of toxic lead levels in raptors and other birds that ingest lead include ataxia (muscle weakness and an inability to control voluntary muscle movement due to central nervous system being affected), lime-green feces, vomiting, seizures, partial or full paralysis of the wings and legs, impaired vision, organ failure, and death. Lead poisoning affects eagles more than other raptors. Thousands of bald eagles winter in Iowa — estimates of up to one-fifth of the lower 48 states’ eagle population — congregate near open water along the big rivers and reservoirs in the state. Other scavengers like turkey vultures have migrated south. Hawks tend to hunt more than scavenge and an eagle will chase off hawks feeding on a carcass. We do our best to see that each eagle admit (and other birds that are symptomatic) has a lead test, an x-ray (to identify any metallic opacities in the digestive tract or fractures), and receives chelation medication as needed. Chelation is a process of twice daily intramuscular injections with calcium EDTA – the medication binds to the lead in the blood that forms a compound the kidneys can excrete. The blood lead analyzer also requires a re-agent kit (over $400 for 50 tests and many eagles will be tested more than once) and the manufacturer has discontinued this model and is only providing re-agent supplies for a few more months. That means we’ll have to purchase a new / newer blood lead analyzer to the tune of several thousand dollars. The last 100 ml vial of calcium EDTA for chelation cost $270… plus the cost of x-rays and diagnostic laboratory liver lead tests. We continue with these protocols to add to our database of eagles and lead information. You can help us continue with this research and treatment of eagles and all our patients by donating to SOAR. “This is a problem that we can solve,” Dr. Laura Johnson, a veterinarian and a licensed wildlife rehabilitator at Tender Care Animal Hospital in Prairie du Chien, Wisconsin, said in an interview with the North Iowa Times in December 2011. “We want people to know that they can change the kind of ammunition they use,” she added. We don’t know the full impact of lead toxicity on an eagle’s ability to avoid accidents, but think about the implications of people driving drunk and their impaired reaction times and poor decision-making skills, and then imagine how an eagle can fly with brain swelling and vision issues? Lead is an absolutely horrible toxin that impacts all bodily functions. The prevention is simple. Prevention. Ask your hunting and fishing friends to check out the non-toxic alternatives. Hunters and anglers have both had great success with these products. The more folks ask for non-toxic products… manufacturers will continue to improve product offerings. Researchers from across the country have demonstrated that when raptors, particularly eagles and other avian scavengers, ingest lead ammunition or lead fishing tackle, their efficient digestive systems absorb the lead directly into the blood stream and that lead is circulated throughout the body. The body “sees” lead the same as it recognizes calcium. All bodies need calcium and the calcium is absorbed into bones and tissue. The very same thing happens when lead is in the body. The lead is absorbed just as if it was calcium and is stored in bones and tissue. A very small amount of lead ingested by an eagle will cause death — an amount no more than a grain of rice. Some of the research conducted can be found on our site here. Read more about Eagles and Lead research on the website. Please Hunt and Fish Lead-Free!